"Hey, I'm trying to pass the potatoes! My forelimbs are as useless as yours!" Also known as wingers. You may have noticed that many non-primate animals have extremely un-humanlike limbs. They may have wings, they may have fins, they may have claws like a lobster or long grappling hooks like a sloth. But because Most Animators Are Human, they have a tendency to fall back on making the very different anatomy of animal characters—even those who aren't, strictly speaking, anthropomorphic—do things they'd be physically incapable of in order to closely mimic human actions. Therefore, every animal forelimb, no matter how little it resembles a human hand, is prehensile. The Trope Namers are all the otherwise non-anthro cartoon birds who can hold things in their primary wing feathers, such as Woodstock, Daffy Duck—or any and all Anthro birds as well, such as Falco Lombardi who can pilot a fighter. The primary wing feathers sort of look like fingers, so naturally in cartoons they act like fingers. Not a heavily modified and specialized extension of their body covering (meaning that this makes as much sense as Prehensile Hair). This version tends to go hand-in-hand (sorry) with Acrophobic Bird. There is a variant of this trope in which thumbs appear on the front paws of many cats and dogs (and sometimes other animals) when grasping something or gesturing, but disappear when the front paws are just used for four-legged walking or otherwise in a default pose. This variant is sometimes applied to characters with Powerpuff Girl Hands, characters who don't have (apparent) hands. This is usually the very first step in a character/series' Anthropomorphic Shift. It's just easier for animators to draw a character playing the drums or baking cookies using the body motions based off human references. It takes a hell of a lot of dedication to avert this trope, as it involves having to stop and really think about how the heck a penguin could possibly manipulate a tuba. Note: This is such a Universal Trope that, instead of listing every single cartoon animal in the world, we will instead list notable exceptions and subversions. Subverted with Tama the tiger in Hayate the Combat Butler. Despite apparently being a certified boiler engineer, Tama clearly has extreme difficulty in manipulating controls of any kind, or holding things without shredding them. Which is kinda funny since even big cats can sheath their claws. Usually only doing big stretches do claws automatically pop out. Perhaps justified in One Piece, in which Tony Tony Chopper, the Devil Fruit-enabled human-reindeer has obvious hooves, but never seems to have any trouble doing human tasks that would seem to require hands, even play Rock Paper Scissors. In League of Extraordinary Gentlemen, the creations of Dr. Moreau - who are twisted parodies of existing Funny Animal characters - are very anthropomorphic, but the plotline dwells heavily on how unnatural and physically painful it is for them to walk on their hind legs and imitate other human behaviors. Furthermore, the comic book was being faithful to the source, as this is a major point of contention in the original novel as well. Fables has a story arc where the non-human (and mostly non-anthromorphic) Fables are staging a revolution, with the intent of fighting to regain their homelands. They force a Fable blacksmith to adapt human weapons so that they're capable of using them. When an election is held, Rose Red also addresses this when the votes are being submitted. If a non-human fable is unable to write their own name and turn in their own ballot they are to have one who can do so for them. The fable is then to verify that the ballot was filled in to their satisfaction. Big Eggo, an ostrich, the original cover star from The Beano used this trope to try and appear more human. It didn't work, and the character was later replaced by a more human bear. In a DQ ad, a "rock and roll falcon" gives the heavy metal/evil eye sign with both wings. The owls in Legend of the Guardians: The Owls of Ga'Hoole use their feet rather than their wings to manipulate objects. Kung Fu Panda has mixed uses of this trope. Ducks and geese are able to use their feathers like fingers, but Crane (the, well, crane) has realistic wings and uses his feet and beak to move objects. The pigeons in Bolt surprisingly avert this. Even when gesturing, their wings still move like real wings, and they tend to investigate or manipulate objects with their beaks. Done with a variation in the Cars movies. The characters don't have any appendages at all, yet they manage to write, paint, operate machinery, and hold things. This is usually done with a combination of prehensile antennae, prehensile windshield wipers, or clamps. Puss in Boots (and the other cats) in the three Shrek sequels and in his own movie has normal cat paws, but with manual dexterity equal to that of a human. The Gabble sisters and their Uncle Waldo from The Aristocats. Played with in the Spellsinger novels. While the series' intelligent birds have an unlikely degree of manual dexterity with their wings, weapons and tools with special handles—hollow cones they can tuck their feathers' tips inside—are designed for their use. An equine character uses her teeth to open drawers (via pull-ropes) and writes using a pen with an attached mouth-clamp. In Timothy Zahn's Hand of Thrawn duology, the President of the New Republic is a Calibop, an avian sentient species with a number of equine features. They also have wings and prehensile feathertips; the President is shown manipulating keys on a lectern and later signing the Imperial-New Republic peace treaty with Pellaeon. Granted, this is pretty much the trope played straight with the caveat that Calibops are aliens. 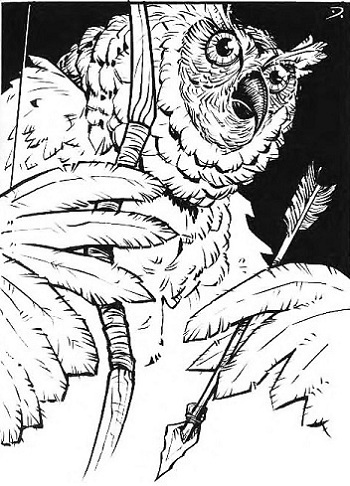 The Ythrians, a bird-like alien race from several Poul Anderson Technic History stories, look basically like huge birds of prey. They do not need to pick up anything with their wings however because their highly efficient respiratory system allows them to hover for long periods of time without getting tired, allowing them to use their feet to manipulate objects. Babar the Elephant, of Jean de Brunhoff's stories, normally uses his trunk to manipulate things, much like an actual elephant would. However, Babar (and all the other elephants of Celesteville, for that matter) walk upright on two legs. This means that there are instances of them using their forelimbs like hands—even though their "hands" look identical to those of quadrupedal elephants, completely lacking in fingers. How this is done is a mystery. Additionally, because they seem capable of using both their forelimbs and trunks to manipulate things, elephants in Babar's world effectively have three limbs that can be used to hold and handle things. De Brunoff's later stories, as well as the TV and film tie-ins take this a step further. Quadrupeds living along side the elephants, such as Lord Rataxes and the other rhinoceroses have hands with fingers. Since Rataxes' troops are typically Card Carrying Villains, they will often have claw-like hands. This is also true of hippos in Babar's world. The Tenga Warriors in Mighty Morphin Power Rangers actually have clawed hands at the ends of their wings. Gary Larson liked to subvert this in The Far Side, even though he was just as likely to play it straight based upon the Rule of Funny. In one comic, two cows were staring at a ringing phone, unable to answer it due to lacking opposable thumbs. Neo-Spacian Air Hummingbird avoids feather fingers by having his wings come out of his back. He has talon hands instead. A rather unusual subversion takes place in the videogame Godzilla: Unleashed. Both King Ghidorah and Mecha-King Ghidorah, who both just happen to be three-headed dragons, use two of their heads/mouths as arms/hands to pick things up. Likewise, Rodan just picks things up with his talons. Then again, this is in line with some of the films, in which Ghidora's heads are essentially hand puppets. The penguins in RuneScape have no fingers. So in the quest where you have to teach them to make music (for the National Anthem, no less), you have to make instruments that does not require fingers. You end up with a cowbell and a bongo. Another very strange example is The Lion King level of Kingdom Hearts II. As mentioned elsewhere, it is a perfect storm of Furry Confusion. Not least because we finally get to see what Donald Duck looks like as a non-Anthropomorphic bird; he has functioning wings, can fly, and carries his staff in his claws. Usually he has very human-like hands. Likewise, when Sora becomes a non-Anthro lion (it is a long story), he carries the Keyblade in his teeth. In the "opening the next path" cutscene, Sora holds the Keyblade with his suddenly-prehensile tail in order to aim at the target. And then on the subject of the actual movie, the trope is played around with. Rafiki being a monkey, he does have real hands. Zazu sometimes gestures with his wings, which sometimes become hand-like, but at least he doesn't pick anything up with them. The lions use their dewclaws as thumbs, sometimes using them as hands. This is most obvious with Scar, as seen when he's tormenting a mouse (he even raises his pinky!) and in his Villain Song. Timon the meerkat is a bit odd. Meerkats in real life have very long, black claws at the ends of their stubby beige paws, so the animators gave Timon perfectly humanoid hands with black fingers to represent these. He pretty much always walks upright; from the waist up he uses his hands like a human would, both grasping and gesturing often. Averted with Lechuku and Nechkuku in Okami. While their outfits do have kimono-style sleeves for the wings, they also have a set of more humanoid arms for holding their weapons, and one of their attacks involves them grabbing Amaterasu with their hindclaws like a normal owl. Alternately averted and played straight with Kazooie. In the ending of Banjo-Kazooie, she has no trouble holding a mug. In Banjo-Tooie, however, the lack of proper hands is a gameplay element, as she cannot hang from ledges or climb ropes (then again, she can fly, so...) In Banjo-Kazooie Nuts & Bolts, this goes back to being played straight, as Kazooie holds a wrench for most of the game. Pecker in the Jak and Daxter series might be a justified example, as he is a Mix and Match Critter known as a "monkaw," a monkey/macaw hybrid. Jet the Hawk, Storm the Albatross, and Wave the Swallow in Sonic the Hedgehog have the same cartoon arms everyone else does in the series, with no obvious wings in sight. Meanwhile, Rouge the Bat has both arms and wings, presumably because combining them would look strange. Inverted with Lugia; by all appearances, instead of having feather fingers, it has finger feathers! Lampshaded in the Harvey Birdman, Attorney at Law Video Game, when Peter Potamus (a purple hippopotamus, for those unfamiliar) attempts to open a cigarette lighter. He fumbles with it for a few seconds, convinces everyone to look at the entrance of the courtroom, then opens the lighter the second the camera is off him. In The legend of Anne Bunny equine characters wear special cybergloves over their forehooves. Girl Genius: Krosp, The King of Cats, has normal cat-like paws with short dewclaws, meaning he can't manipulate that many things that need opposable thumbs or hold that many things without using both paws well, like a normal cat. In Peep and the Big Wide World, most of the major characters don't even have visible forelimbs. So they hold things in their beaks (like actual birds). Chirp does have visible wings but she uses them mostly to gesticulate. I Am Not an Animal is a British animation about a bunch of superintelligent animals who are released from a research facility. The nominally smartest of them, a horse, is mortified that he can't put on his pants by himself now he's outside the research facility. He uses magnets on his hooves to hold knives and forks, and the sparrow somehow attaches plastic fingers on sticks to his wings to allow him to type and play keyboard. In the current show Friendship is Magic, ponies need to use their mouths (or, for unicorns, their magic powers) for most things we use our hands for. Sometimes, however, the ponies give up and just manipulate or even inexplicably grasp things with their hooves. Pegasuses have also sometimes used their wings in a way that is closer to the trope name than it is to what wings could actually do. The general rule seems to be that the unexplained hoof-grasping is avoided unless it becomes too inconvenient to do so, with a preference for more creative solutions that at least work physically if not physiologically, like a Prehensile Tail. Averted—for the most part—with the fish in Finding Nemo. Not so much with Nigel the pelican. His primary feathers are fully rendered in extreme detail, so they are practically a Lampshade Hanging on how odd this looks. Somewhat related is one of the major criticisms directed at Happy Feet. The result of using motion capture footage of humans to animate penguins tap-dancing ends up very strange, due to the wildly different anatomy. There have been a few similar criticisms leveled at the aforementioned Legends of the Guardians as well. Coco from Foster's Home for Imaginary Friends carries things in her beak and feet, and nearly all imaginary friends manage to make the best of their bizarre anatomy. Iago the parrot from Aladdin holds things in his beak and claws while flying, but uses his wings as hands when on the ground. In at least one episode he loses all his feathers and we can see his wings look like mittens, with opposable thumbs. Granted, if you pay attention to the anatomy of the "hand" next time you eat chicken wings, it does look like a mitten... sort of. But play with the Alula ("thumb") a bit and you'll note the range of motion is very restricted. The cows in Home on the Range can't really hold anything in their hooves, so the animators gave them prehensile tails and tail tufts instead. Played straight in the film adaptation of The Trumpet Of The Swan. We mention it here because the book had actually averted this trope and had the swan play with his feet. This was a major plot point in the book, in fact. Louis at one point asks his Token Human Friend to cut apart the webbing between the toes of one of his feet, thus severely handicapping his ability to swim and fly in exchange for being a more dexterous trumpet player. Averted in Arthur where the character George (a moose) was actually drawn with human hands instead of hooves. On Fish Hooks, the characters' fins actually change shape between semi-normal fins and hands. Unlike the above example, Sally the fish on Scaredy Squirrel uses her fins straight, without them changing shape or being hand-like in nature. Used in one of Robot Chicken's shorts parodying the Muppet Show and the Muppet Babies. When the murderer (who happens to be Skooter dressed up as his homicidal sister, Skeeter, to seek bloody vengeance on the other muppets after they drowned her when they were baby muppets and kept it a secret throughout their lives) corners and is ready to kill the remaining muppets Kermit and Miss Piggy, Carmilla the chicken (Gonzo's love interest before he was killed off first) threatens him with a drawn bow and arrow, prompting the incredulous Skooter to call out on this trope: " You can't shoot me! Chickens don't even have fingers!" (is shot dead). Most of the cast of Birdz has mostly arm-like wings which they use just like normal arms despite also being capable of flight. Strangely, one episode has them bowling with their feet. Donald Duck and Daisy Duck not only have awfully handlike wing feathers, they develop Tail Feather Fingers from time to time in the Classic Disney Shorts. Averted with Roadrunner from Looney Tunes. He carries things with his feet instead of his wings. Since we're on the subject of avian "hand" anatomy, this is a major point of contention among Paleoartists: Did Maniraptors have truly opposable thumbs or what? It's thought that some of them did, like Bambiraptor, but the others are a puzzle. And this is quite relevant to this trope, as most Anthro artists unquestionably assume that they did. Seriously, though, about the only thing anyone agrees upon is that the "kangaroo hands" in Jurassic Park are all kinds of wrong. A good reference for this can be found here (with super-cute illustrations). Inverted with Koalas. They have eight opposable thumbs (two on each paw). Averted with the lions in The Lion King. They keep their thumbs/dewclaws even when their paws are just used for walking. A odd case in Melonpool: Sam T. Dogg is a telegraphic dog with no thumbs for most of webcomic with funny jokes, but suddenly had thumbs at one point with lampshading about lack of such in past. Scooby Doo sometimes did this, especially in the earliest cartoons. He would normally walk around on all fours, with very dog-like paws, but when a zany scheme was involved, he'd stand up on his hind legs with no difficulty, and thumbs would mysteriously appear on his front paws. Family Guy's Brian the Dog is perfectly canine in every respect (other than speech and bipedal movement), but he still has hands with thumbs—but these turn to normal front paws without thumbs when sitting on the floor on all fours like a dog. Otis and the other cows from Barnyard and Back at the Barnyard have real looking front hooves when masquerading as ordinary cows in front of the farmer, but change into prehensile black mitts with thumbs when bipedal. Rita from Animaniacs has hands with thumbs when she's on two legs or gesturing, but these turn to normal front paws without thumbs when she's on four legs. But averted with the Warner Sibs in the few instances that they're standing on four legs. They not only retain their thumbs when they're on four legs, their hands still look like hands on the floor. Pooh and Tigger from Winnie the Pooh have Powerpuff Girl Hands with thumbs that appear when they grasp something or gesture. Thumbs sometimes appear on the paws of Pluto the Pup, Figaro, and other "non-anthro" Classic Disney Shorts dogs and cats when they grasp something or gesture, but sometimes they don't. This page was last edited on 15 February 2018, at 15:22.